Posh goalkeeper Jonathan Bond saves a penalty in an FA Cup tie at Woking last season. Peterborough United boss Steve Evans says his players must match Bromley’s desire if they are to avoid become headline news on first round FA Cup weekend. Posh travel to a National League side who sit 58 places below them in the Football League ladder tomorrow (November 10, 3pm). Bromley do have the advantage of hosting the game on their artificial playing surface. Gwion Edwards can't believe he has missed a chance to score against Tranmere in an FA Cup tie last season. Evans is likely to make changes to his starting line-up with forward players Marcus Maddison and Jason Cummings in the running for a recall. Posh are expected to retain their 4-4-2 formation. “We are playing on a false surface tomorrow,” Evans stated. “There is a reason why the top 92 professional clubs in the country don’t have one. “But if Bromley perform better than us on it, we can’t take any credit away from them. “We have practised on our own 4G surface all week and you can see we have become more comfortable on it as the week has gone on. “We will embrace the pitch tomorrow and we will do our best to reach the next round. “We will be professional andnd what we must make sure we do is match Bromley’s desire. We have to want to win the game as much as they do. “I’ve been in Bromley’s position. I’ve managed non-league clubs against league clubs in the FA Cup and I know how motivated underdogs always are. 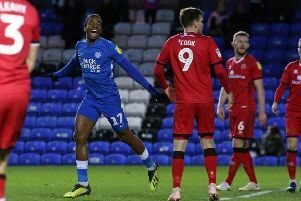 Posh needed replays to beat National League sides Tranmere and Woking in the first two rounds of last season’s FA Cup. Woking saw a penalty saved by Posh ‘keeper Jonathan Bond in the first tie which finished 1-1.